Made in America from 100 percent Organic Cotton! Back in stock by popular demand! 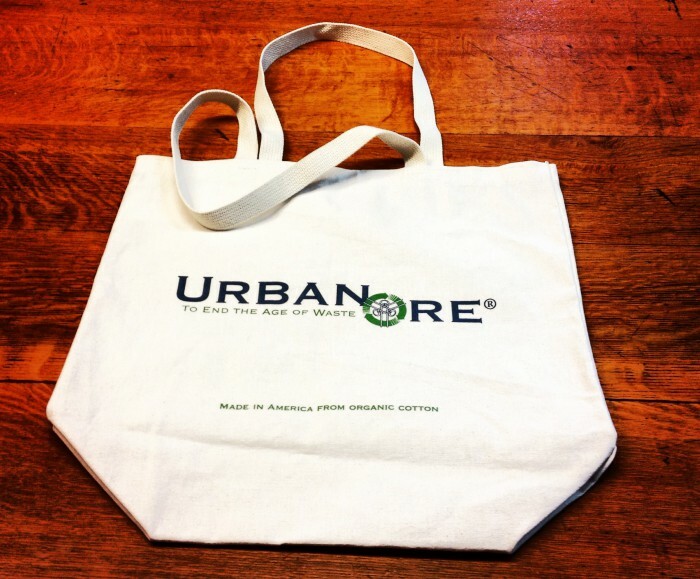 Urban Ore canvas bags are proudly made in the U.S.A. from 100% organic cotton. ONLY $5! Now that Alameda County and other neighboring cities in the Bay Area have adopted plastic bag bans, demand for canvas bags has skyrocketed. Why not try one of ours? These large-capacity, sturdy canvas bags are perfect for groceries and other errands. Long handles conveniently fit over the shoulder, leaving your hands free to ride a bicycle. We’ve banned the plastic bag. Now say NO THANK YOU to 10 cent paper bags! And by saving 10 cents per paper bag, you’ll be able to afford that sweet, vintage Schwinn cruiser you’ve had your eye on. Beep, beep! Did we mention these bags are made from 100% all natural organic cotton? That means they are compostable as well! You will also be happy in the knowledge that you are saving precious resources by not using paper bags each time you take a trip to the grocery store. Dimensions: 18”w x 17.5”h x 7”g with 25” natural cotton web handles. Perfect for groceries, laundry, camping, the gym, anything! I enjoy shopping, please keep up the good works.